The Problem with Up – Love. Life. Practice. A very simple idea today, about terms. Are you childish, or are you a grown-up? The term childish has some very pleasant connotations. Carefree. Fun. Loving. Curious. Excited about the world. Enthusiastic about new experiences. Innocent (though honestly, how anyone who has ever actually dealt with kids for an extended length of time could think that, I won’t understand. They can be evil little f…ahem). As I was saying, there’s also a more pejorative version of the term. Childish is frivolous, is not serious, is reckless, is dependent on the care of someone else for both practical aspects of life as well as a moral compass. Someone who is childish is *irresponsible*. In movie after movie, you see the “hero’s journey” of Campbell portrayed as some man who has to “put off childish things” and grow up to take responsibility for his life. Personally, I have troubles with the idea of “up”. It’s much like the old zen story about the master who was having tea with a foreigner (or a student, the stories vary). As the master poured, the guest was waxing eloquent about this precept and that reading and obviously showing off just how much more zennish he was than anyone else. If a gas tank is filled up, you can’t fill it any more. If a spring is all wound up, you can’t wind it any more. If If I pull out a tissue and use it up, you can’t use it any more. If I’m grown up, I can’t grow any more. And I don’t like that. I don’t know anyone who couldn’t stand to do some more growing. I certainly can use some. I still have to learn Japanese, wing tsun, rock climbing, hang gliding, and Ruby on Rails. I never did get as good at blues guitar as I wanted; there are so many songs still waiting for my fingers to grow into them. 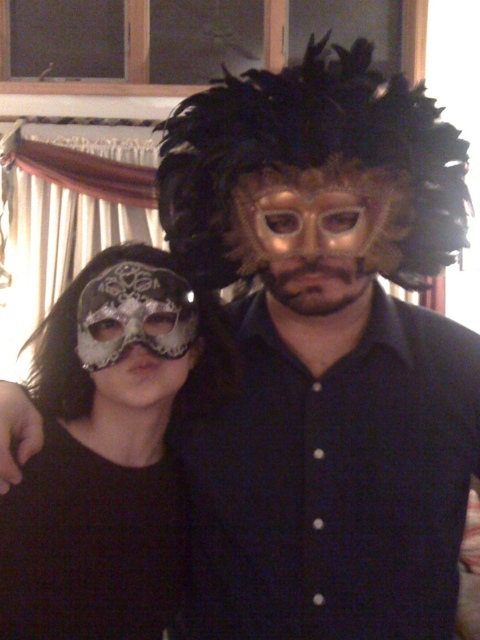 My daughter Danica & I being adults. I am not a grown up. No way, no how. Yet at the same time, I can’t say that I haven’t handled a lot of responsibility in my life. Raised four kids, ran my own business, served as a U.S. Marine, volunteered as an Emergency Medical Technician, even stayed loyal to Apple in the Dark Days of Amelio and the pre-Superbowl Packers. That’s HEAVY. I believe you need another term: Adult. Not grown-up, because an adult can both appreciate the wonder of the world with a child-like (see how different “-ish” is from “-like”?) wonder, open to learning new things and eager for new experiences. At the same time, an adult tries to learn from those experiences, and at times embraces the experience of working hard, even at something that is not immediately enjoyable, for the experience later on of accomplishment and the satisfaction of a job well done. Some really advanced adults don’t even need that reward, I think. They have learned to appreciate the journey itself, as opposed to looking constantly for future reward. I’m still working on that one; problem is, working towards a goal of enjoying the journey for its own sake is kind of an oxymoron, if you think about it. “I won’t grow up!” sang Peter Pan. And I say, damn right. Being an adult is way more fun.